I woke up rather late, at 8:30. There was a mosquito in my room that mollested me throughout the night. At the rare moments when I got some sleep I dreamt of a big blood-sampling project that was too complicated and was getting out of my hand. When I came down to breakfast all the tables were taken - there were about 15 Harley-Davidsons sitting at three tables. Helena had me seated at a table together with an exausted-looking couple. The breakfast was unusually modest and there was a big competition over 6 slices of salami and 3 slices of cheese. I rightly assumed they were all mine, since Helena brought them after I came, together with my coffee and bread, so I helped myself without embarassment. The lady Davidson through some fierce gazes at me, but I didn't bother. She could loose a pound or ten, anyway. After a while each of them got an boiled egg, and that prevented a bloodshed, I guess. So, up the Wurtzenpass I went. Stelvio, Giovo, Sella, Pordoi, Falzarego - all this reknown climbs above 2000 m were nothing in comparison to the Wurtzenpass (from Austrian side). There is a 800 m section of 20% that I could master only through 4 stops. Two roadies who overtook me, showed that it is perfectly possible to do it in one go, if one has appropriate gears - and strenght. In Slovenia I was feeling at home. I didn't have a map and navigated by memory and by sometimes ambiguous road signs that our little country has. I wasn't even ashamed to ask for directions, although that chipped off big chunks of my self-sufficiency. Had I been a bit earlier, I would go to Vršič, to have a direct comparison how it measures with world-class passes. But climbs were obviously my addiction on this tour, so, just before coming home to Ljubljana, I made a final turn-off to 6 km pass at Katarina - and it almost defeated me. Day 7: 130 km. Total 946 km. Most of the morning I cycled on cycle paths that twist around the main road, straddling the sides of the valley. Last 10 km however, I took the main road and despite the rather busy traffic it was a pleasant fast ride, more so as I knew that just 7 km from the border I will turn right into less frequented road (#111) along the Lesachtal. 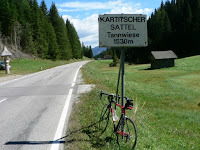 The #111 started with a bit tough but nice 500 m climb to the Kartitcher sattel at 1535 m. Then instead of turning down the road waved up and down for the rest of 45 km to Kotschach. I must have made anoter 1000 m of cumulative climbing in these undulations. However, with fine warm weather, intriguing winding road, not much traffic and great views down to the valley and up to the surrounding peaks, I loved every minute of it. From Kotschach I rushed on the main road (#110) at 40 km/h with a massive tailwind and soon I compensated for all the time lost in whirling on cycling paths that morning. I set a target at 170 km mark for that day and as I came close to it within 1 km, I spotted a supermarket, which was ideal, as I planned on a big and cheap dinner that evening. I bought about 1 kg of food, put it in a plastic bag and rode to the first guesthouse in the village. "Leider, wir sind voll, alles ist reserviert" was the answer! I just couldn't believe my luck: in Austria, the country where you can be certain to get a bed and breakfast at the most tiny settlement any time you show up, they are full! Oh well, I'll just ride then to the next village. So with a 1 kg plastic bag in left hand (about 1/2 of all my luggage) I cycled off to the next village. 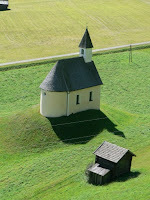 But there were none until Arnoldstein - which was 10 km away. And at Arnoldstein - as you might have guessed - every guesthouse and hotel was full. The reason: the big Harley-Davidson fiesta was announced for tomorrow at some nearby lake and the bikers reserved every single bed in the whole valley. Jesus! I thought bikers were more relaxed than that - reserving in advance somehow doesn't fit my image of free, unconventional, intrepid spirit seeking speed and adventure. 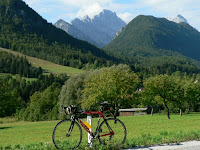 So with 1 kg plastic bag in the left hand, half an hour before dark, I cycled off for the next 15 km, towards Villach. Half way down the road there was a turn-off to the right to Slovenia via Wurzenpass. I stopped there to think. If the whole valley is reserviert, then I might have problems finding accomodation in Villach. In Slovenia I was sure I could get a bed in Kranjska Gora or even in Podkoren, which is about the same distance as Villach. 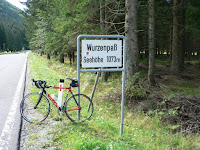 There were two drawbacks however: the terrible 20% grade section on Wurzenpass and 1 kg plastic bag in my left hand. Nevertheless I turned right. After 100 m I saw a sign for a guesthouse "Helena". I might as well try it, it'll take only half a minute to hear they're full. I rang and the lady Helena opened. From her peculiar dialect I half-understood that someone had reserved, but with it being so late they will probably show up tomorrow rather then today, so I could get a room for 22 euro just for tonight. OK said I, OK said she, I put the bike in the courtyard, went up to the room, put a 1 kg plastic bag on the table and looked at the computer. I made 194 km today. Sometimes in the past I strongly discouraged anyone to cycle with a backpack on the back, even if there was only a sandwich in it. Today I cycled 25 km with 1 kg plastic bag in my hand and I was feeling perfectly fine. Maybe it's time to reconsider some alternative ways of carrying luggage on a bike. Day 6: 194 km. Total 816 km. Some more passes were waiting. 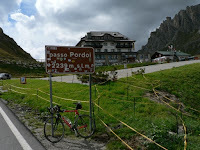 Instead of going directly to Bolzano I planned a loop through Vipiteno, covering Passo Giovo and Passo Penser. 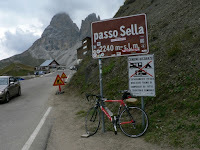 The weather improved, so I was sure that there will be no problems with passes that are at least 500 m lower than Stelvio. It turned differently, however. 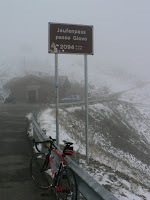 The climb to Passo del Giovo (Jaufenpass, 2099 m) started in the sunny morning. 13 degrees at 700 m altitude should have warned me, though, what was going to happen. About half way up, just before the tunnel, the rear tyre blew off. The moment I heard the hideous hissing sound I knew what was going on. When I took off the tube I didn't have to look hard to find the puncture - it was at the base of the valve. A day before the trip the front tyre blew in the same manner, but I was just to lazy to fix the rear one too. But in half hour everything was fixed and I moved on. The temperature was rapidly decreasing and near the top it again dropped below zero, this time even with a full snow storm and icy gale. Once again my hands froze and I struggled even to make a photo at the top. 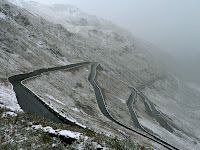 I expected that the ride down will bring some relief (as was the case yesterday on Stelvio), but it seems that in cycling buisseness there are no generalizations and that even two identical set of conditions lead to two different circumstances. So, I was shiverring all the way down to the valley, where the snow turned to rain bringing no improvement. I like riding the big climbs, but there has to be an element of enjoyment in it, and I couldn't find any of that in the past hour of climbing and descending from Passo dello Giovo. 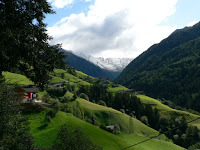 The weather down in the valley was as grim as it could be, so I gave up on original plan of climbing 5 more passes nad headed straight to Austrian border. Day 5: 103 km. Total 622 km. 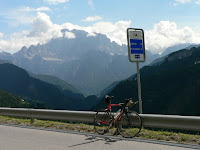 The yesterday's descent continued to Bolzano, where I followed the signs to Merano and ended at a no-cyclists sign on top of the viaduct and at the start of the motorway. Just beneath me was a cycling path following the river and going in the right direction. If only I had a rope to land down. Instead, I spend half an hour walking back and searching for the turn off to the cycling path. 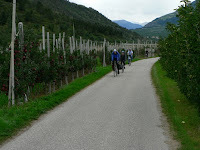 Once I've found it though, it was fast, peacefull ride among the inviting ripe apple orchards. 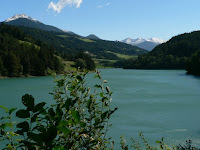 In Merano another hour was spent to find the way to Vinschgau valley and then again a cross-orchards route followed for about 50 km to the Prato dello Stelvio - the starting point of the big event tomorrow. Day 3: 115 km. Total 413 km. 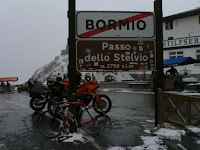 This was a day like I imagined the one of riding in the Dolomites to be - pass after pass with fast descends in between. 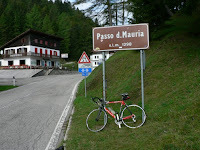 It started with quick 6 km climb to Passo Mauria (1259m), then down into the Cadore valley (now I know what that song was about), up to Cortina and on to Passo Falzarego (2105m), down again loosing 600m, up on Passo Pordoi (2239m), down for 400m, up to Passo Sella (2244m), and finaly a long 1500m descent through Val Gardena. It wasn't too cold, so that I didn't need to put a wind jacked going down, good roads, not much traffic - a fantastic day! 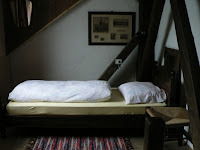 I got a room in a medieval castle with old wooden furniture and leaking roof. A rain front passed during the night, exactly as it was predicted and I expected fine weather for the rest of the week. Day 2: 149 km. Total 299 km. The ride to the train station in the morning made me think that I packed too light this time. It was quite chilly and I was glad that I included an undershirt at the l ast moment. Things were rolling basicaly fine for the first 100 km from the train station at Jesenice to Tolmezzo with just one incident, when I hit a pothole going down in badly lit gallery before Tarvisio. It was a hard blow and bang, but there was no visible damage to the wheels or rest of the bike and luggage. 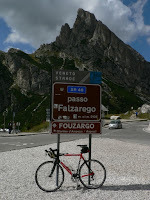 After Tolmezzo I had to start pedaling. I guess I got out of practice, since I mostly coasted down from Kranjska Gora, and I started to feel the dreaded bicycle bonk. Obviously, two Sneeker bars were not as energertic as advertised on TV. In Forni di sopra I stopped for a sandwich and after another couple of kms, just before the first pass, I checked into a pension that looked cheap enough. 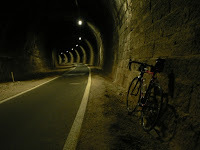 The todays temperatures were around 18 degrees, but I still felt a bit cold, especialy on dowhills after a sweaty climbs. After dinner I cut off the lower part of the undershirt which was just soaking with moisture and cooling me down. 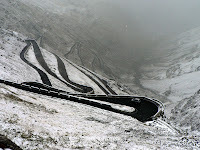 The second highest pass in the Alps, the famous Stelvio, is about 400 km from my home. Too close and tempting to be overlooked. 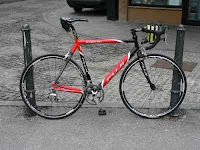 A week in the Alps in september, good weather and still high temperatures, a 1000 km credit card tour with new light bike, a fine dinner with a glass of wine after a day's ride up and down some Dolomite passes - isn't that a consumation devotely to be wished? 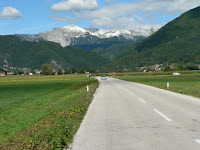 Route planned: Jesenice - Tolmezzo - Cortina d'Ampezzo - Sella Ronda - Boltzano - Stelvio - Bormio - Bolzano - Cortina - Sillian - Kotschach - Arnoldstein - Kranjska Gora - Ljubljana.